Here we have 'X' (and 'O'?, they seem to go together like kiss and hug) reaching out and grasping the hands of a mirror image box toy. This makes me think of the times that we see in someone else a mirror image of a part of ourselves. However fun it may be to be offbeat and quirky, it can feel a tad isolating if we really feel like we are the only one who appreciates, say, tarot, or the Phantasmagoric Theater Deck, or Soy Milk:-) As interesting and educational as ideas are that differ from our own, that warm, wonderful Ten of Cups feeling tends to come when we find in someone different from ourselves a sympatico heart. Graham's book speaks of marriage, and this reminds me of my husband and I when we met: "You like Monty Python? You love living in the desert? You have Elvis Costello albums? ", and a few, more important qualities, and Zap!, Zing!- Ten of Cups energy. When enough of that energy abounds, we find that we can commit to that person and that together we can commit to the causes that we share in common. "Baile and Ailinn were lovers who had been parted. On hearing false report of each other's deaths, they each died and were buried in separate graves. Out of Baile's grave grew a yew, out of Ailinn's an apple. After some years, poets and and seers cut down the yew to create a poets's tablet relating the vision-tales, feasts, loves and wooings of Ulster. Similarly, in Leinster, the poets made a poet's tablet out of the apple tree relating comparable tales from Leinster. At the Samhain feast held by Art mac Conn, both ranks of regional poets assembled, bringing their tablets with them. The two tablets sprang together, inseperable as woodbine about a branch. The unified wood from the lover's graves was kept in the treasury of Tara as a wonder." Graham's booklet says: 'X' the box toy has found himself a lover, and there is a unity between them. They share a deep commitment, and feel a mutual exchange and dedication to each other. Together they are at one with the universe, and know that to be involved in life is to be commited. We get out of life what we put in. Divinitory Meaning: The Ten of Cups represents marriage and strength of emotion. Reverse Meaning: Unstable, uninvolved, selfishness." Whoa. I completely missed the tie in with the 7 of Cups- Scoop and X. Graham did not leave us at that poignant moment of parting, with X's little hands out toward someone who needed to move on, but gives us the happy outcome in the Ten of Cups. Edited to remove not one, but two cliches; somewhere, my English teacher is smiling. That is so awesome - X is featured twice! Are there other characters we see more than once? Fingerpin: the 6 and 8 of Wands. "Yellow Blob" (I decided it was a Pooka and named mine Huddle, but would like to hear what anyone else thinks of it as): the 8 and 10 of Wands. Ludwig: the 6 and King of Wands. Bundie: the 6 and 9 of Cups. The Sandwitchers: (the consequences of their actions, not they themselves) the 5 of Cups; the 6 and 9 of Cups. One of the figures from the 2 of Cups: the 9 of Cups. One of my favourites. It is such a great version of the '10 of Cups' as it shows that harmony and love so well - those hands held together! I like your attention to the trees as well - how they mirror just like the box toys. I was so sad for 'X' when Scoop left. At the time I read about Scoops 'moving on', I hadn't noticed that 'X' appeared again. When I saw the card, it was like 'Awwwww ... he found his soul mate'. If Scoop hadn't have left, maybe he never would have. They have their boxes to put themselves away in, they have nature and their 10 cups, they have each other. This is such a complete and warming card. Spells it all out perfectly. A friend of mine has been asked to be a sperm donor for a couple he knows. The couple wants to have two children. I did a reading (for myself) about whether or not my friend should agree to it, and the 10 of Cups came up. How perfectly apt! 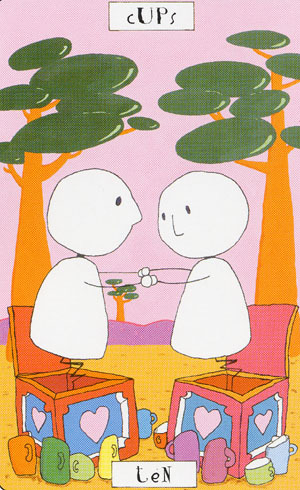 The card works in a number of ways: the most obvious of which, is the interpretation of the two box toys as the two babies. But each box toy could also be seen as symbolizing one side in the agreement; one is my friend, the other the couple, and both are touching each other's lives in a profound way. And on the most basic level, the card could merely be showing the couple itself, their love and commitment to each other, and their strong wish for children. The card helped me get over my own reservations about the issue, even if I'm still not entirely convinced it's a good idea. ‘X’ the box toy has found himself a lover, and there is a unity between them. They share a deep commitment, and feel a mutual exchange and dedication to each other. Together they are at one with the universe, and know that to be involved in life is to be committed. We get out of life what we put in. Divinatory meaning: The Ten of Cups represents marriage and strength of emotion. Reverse meaning: Unstable, uninvolved, selfishness. As always, your thoughts are more than welcome.